In this tutorial, I will walk you through the steps of writing a simple app to create and control todo -lists. We will be using VueJS (v2.6.10) and Framework7 (v2.1.1), so basic knowledge of them is recommended. A side panel on the homepage to switch between created lists. Open the project folder in your code editor — all the files we will make changes to are in the components folder (app.vue, home.vue, createlist.vue). Note: Sometimes when making changes to app.vue, Framework7 re-initializes itself and the app stops working. You will get an error in the console. If this happens, just refresh the page. A button outside the list that fires the method to get input data. IMPORTANT: Framework7’s VueJS components do not support v-bind. So instead, we need to use Framework7’s custom DOM library, Dom7. Here we read the form inputs with this.$f7.form and call a function convertToData to convert the inputs into a readable format. Then, we store the inputs, reset the form by emptying the fields (using Dom7 to target inputs that have a value), and reset the data properties. We will push the created list to an array of lists so that we can store them all. The :disabled property disables the button conditionally depending on whether the value of the disabled data property is 1 or 0. This is determined in the pre-created validateForm method. The button will be disabled if the list name input is empty, or if the listItems property is empty (no tasks are added). So now, we need to create the addTask method that’s run when we click the “Add task” button. So now if you write something in the task input and click the “add task” button, it will push your input to the listItems array, and you can keep creating as many tasks as you’d like. We are using v-for to dynamically print the tasks as they are added. The pre-created validateForm method stores the list name input to the listName property, so now the preview updates on input. Because we are printing the list items dynamically with v-for, we don’t need to do anything else. Next, we need a way to display the list on the homepage automatically as it’s created. On the homepage we will want to check and uncheck tasks, and delete the list. This will emit a custom created event and pass the createdList data property to the parent which in this case is app.vue. Then it will change the view to the home tab. Remember: editing app.vue will reinitialize Framework7 and it will stop working. If this happens, refresh the page. 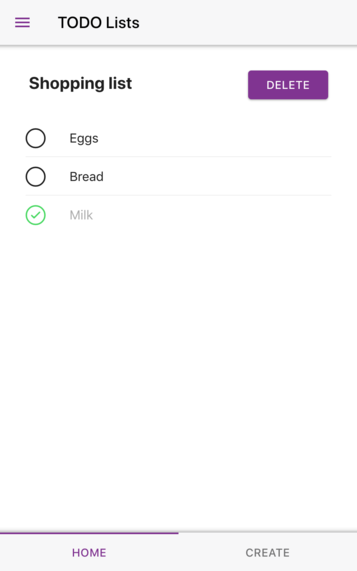 After making this method and adding a todoList data property, if we console.log this.todoList or this.lists, we can see that the object has been emitted successfully and we can now pass them both forward to home.vue as props to use later. For now, nothing visible will happen as the method only stores the selected list in the todoList data property and closes the side panel. We’ll move on to the homepage view now to implement the main list view and functions. Here we are printing the homepage content conditionally. If no lists exist, it will display a message, and if one or more exist, they will be printed with the checked and unchecked tasks separated. Since the homepage is where we use the props, we should create computed properties out of them. In Vue, you should never mutate props directly. Instead, we can mutate the computed properties. Now we can start writing the methods to mutate our list without touching the props directly. However, first let’s set a watcher to the todoList prop. This means that we can call a function whenever the value of the prop changes. In this function we check if the new value of the prop is empty or not — so when a list is selected, this.listSelected will change to true and the list will be displayed on the homepage tab. And with that — we are done. For the finished code, you can check out my repository: https://github.com/nataliasulkama/todo-tutorial. Pushing the web current through hybrid mobile and PWA technology. Presented by the Monaca and Onsen UI team.